"Avocado adds extra creaminess to this zesty, reduced-fat mac & cheese with chili powder, lime juice and chives." In large sauce pot, cook pasta in salted water according to package directions. Meanwhile, in a small saucepan, combine milk, garlic, nutmeg and chili powder. Bring to a boil; reduce heat; simmer for 5 minutes. 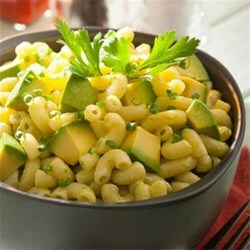 When pasta is almost cooked, place in blender the parsley leaves, 1 1/2 cups of the diced avocado, the cheese, lime juice and hot milk with garlic cloves; whirl until smooth. Drain pasta and return to sauce pot. Pour cheese sauce over pasta; toss to combine. Add chives and remaining 1/2 cup diced avocado; toss gently. Serve hot or at room temperature. Best when served the day of preparation. Use linguine in place of elbow macaroni and add sautéed bay scallops; use rotini (spiral shape) in place of elbow macaroni and add steamed shrimp; add spring vegetables to basic recipe. I followed this recipe pretty much to the letter, and I would not change a thing, I did use Cooper Sharp cheese and the flavor was awesome! I think a good sharp cheddar cheese makes this recipe! This is too bland. I wouldn't try this again. The avocado turned brown almost immediately and definitely lacked flavor.